Emerging from the subway tunnel, I strolled down the dark, debris-strewn Brooklyn avenue and saw my destination on the corner ahead: Di Fara. Its wraparound sign read simply Di Fara • Pizza • Italian Heros, as common as any number of cheap sub joints across the country. It lacked fancy gimmicks, neon, or any other visible means of drawing in customers, at least from an aesthetic point of view. The air around Di Fara was rich with the scent of baked dough and melting cheese, as enticing a lure as anything I can imagine. Much has been written on the internet of the long lines at Di Fara stretching out the front door, and with the tantalizing smell of pizza clinging to the street corner like this, I knew now these tales had to be more than mere myth. Surprisingly though, there wasn't much of a line now, around 8pm. I opened the front door and stepped inside to find only three or four people at the counter. Incredible! As it happened, that number quickly grew to about twenty in the span of time I was there, so thankfully I got in my order before the rush. Di Fara is notorious for the complete lack of structure when it comes to serving its customers. To call it a line is a compliment: it's a shifting mass of people, a cluster of sociopathic minds and a total disregard for common courtesy, so large that it has no choice but to form some semblance of a "line" that more closely mimics an amoeba. Customers crowd the counter in a state of utter chaos, elbowing others aside to get their order in first. As I said, I missed all that by a brief amount of time, thank God. For a while, I was able to just stand at the counter and watch Dominic DeMarco go to work. 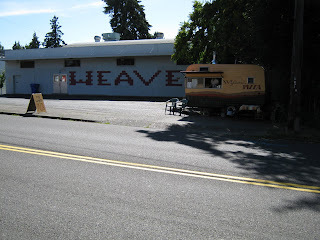 I won't delve into Dominic's history here--you can read A Slice of Heaven or check out the Slice blog for that. I'll leave it at this: Dom DeMarco is 72 and has been making pizza for 50 of those years. He's spent 45 of them at this Brooklyn location, making every single pie himself. Let me say that again: he makes every single pie himself. That night one of his sons was helping him grate the cheese and slice the pies, but apart from that, only Dominic touched the pizzas. He's slow, almost comedically slow, but watching him make pizza is akin to watching a great artist transform a blank canvas into a breathtaking landscape right before your eyes, or a sculptor bring lifelike human features to a formless lump of clay. You're mesmerized. Pies come in two varieties at Di Fara: round and square. 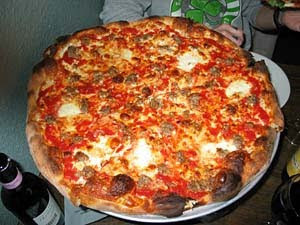 The round pie is your typical New York pizza, with large, crisp-bottomed slices. The square pie is a sort of Sicilian/grandma-style hybrid, with a thicker crust and more sauce. Both are cooked in Dom's multi-tiered gas oven, with several pies in there at any one time. Dom watched them all, adjusting their location when necessary, while his son kept track of how many pies were currently inhabiting each tier. What separates Di Fara from most of the other slice joints in America is that its slices are not pre-made and then reheated in the oven when a customer orders one. Instead, they come directly from a fresh-cut whole pie, and they don't last long. The wait for a slice can be excruciating, as you must contend with everyone else waiting for one, as well as the people who have ordered a whole pie. How discouraging it is to see one of Dom's enormous pizzas come out of the oven piping hot, only to have the entire thing disappear into a box and be handed over to someone else! Bastards! I started with one of the regular slices while I waited for the next square pie to cook, and by now I had been waiting there at the counter about, oh, I'd say half an hour. I was famished, even though I'd gorged myself on pizza at the Pieman's Craft event earlier that day. Then it happened: Dominic pulled out one of the regular plain pies and set it not in a to-go box, but on a tray. This is it, I told myself. Here it comes. Before Dom sends the pie out, he drizzles more olive oil onto it (the second application of olive oil, it must be noted--the first is applied before the pie enters the oven), spreads a generous handful of the grated padano on top, sprinkles some fragrant oregano around, and brings out his kitchen shears to snip fresh basil on top. Only then does the pizza cutter make its appearance, and when Dom mans it, each lateral slice is made deliberately, carefully, so that each slice is as close to being the same size as every other slice as possible. 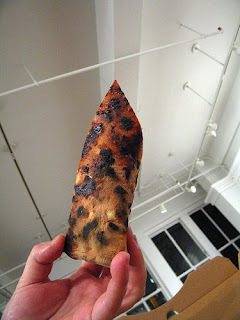 Though my slice was so hot it was steaming, I foolishly bit straight into it and scorched the roof of my mouth. Pizza burn...how embarrassing. I should know better. After giving the slice a minute to cool off, I tried again. I knew almost immediately that it was the finest NY-style slice in the city. There is so much right about this pizza, I don't know where to begin. I suppose the biggest contribution to its greatness had to be the crust. It's crunchy, but not cracker-crunchy; that is to say, the inner layer is dense and chewy. This crust tastes incredible. It's salty, but not overly salty, evoking the qualities of the very best bread. I loved it, and could have eaten it without any of the toppings. The rest of the ingredients blend together so well that, with the exception of the overabundance of olive oil, it's hard to imagine any component being omitted. The sauce is vibrant, chunky, and tastes of the freshest tomatoes. The mozzarella/padano combination is salty, gooey, and just the right thickness for the crust, neither weighing it down nor leaving you wanting for more. The freshly snipped basil is potent and plays well with the cheese and tomatoes. The olive oil, while heavy-handed, worked its way into the other ingredients and tied everything together. This was one outstanding piece of pizza. Another twenty minutes later and I finally got my square slice. This crust is markedly different from the one on the round pizza. Dom pours several ounces of olive oil onto the square pizza pan this pie cooks in, transforming the bottom of the crust into a thick layer of crunch. The majority of the slice is comprised of Dom's tomato sauce, and I think this is this slice's downfall. 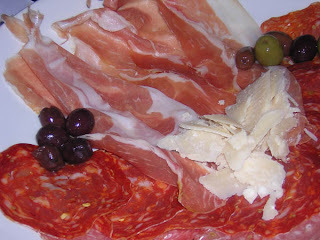 It just overshadows everything else, even the buffalo mozzarella and grated padano that has been nicely browned on top. Perhaps if I had ordered some meat on this slice it would have shifted the balance a bit, but in its current form, it was just too much tomato sauce for me. Still hungry after all the pizza I had eaten at the Pieman's Craft event and the two slices I had had here, I wanted one more of the regular slices to end the evening on a high note, and lucky for me my dining companion Christa managed to cajole two girls at a neighboring table to sell us one of their slices at the same price Dom charges: five bucks. They seemed shocked to even be asked, but in the end they sold us the slice, God bless 'em. I'm glad I got that second slice, because it revealed how wildly inconsistent Dom's pies are. While the first slice had bordered the verge of being too oily, this slice had blown right past that into the realm of Far Too Oily. It had more oregano on it than the first slice, and somehow the crust on this slice was even more flavorful than the first! It was so good, in fact, that I wasn't bothered by the deluge of extra olive oil whatsoever. This was just an amazing, amazing slice of pizza. As I mentioned earlier, Dom charges $5 a slice here, the highest of any slice in the city. Many have asked if the slices are worth that. I can say in no uncertain terms that the regular slices are, unquestionably, worth every cent, especially if you order the whole pie. I wouldn't order the square slice again, but I'm still dreaming about the regular plain slices. I doubt very much that anyone else makes a better pie in that style. May Dom live a thousand years, and may he bless us with this unparalleled pizza for every one of them! It was the volleyball that did it. Chris Bianco of Pizzeria Bianco has, for several years now, basked in the ebullient exaltations of Oprah, Martha Stewart, Jimmy Kimmel, and, far more importantly, pizza aficionados Ed Levine and Peter Reinhart. He is widely regarded as serving the best pizza in the U.S., and in the opinion of Mr. Levine, the best in the world. That's high praise. Then, as fate would have it, a friend of mine and fellow pizza fanatic from Los Angeles scored a press pass to photograph the Association of Volleyball Professionals (AVP) championships in Glendale, the city adjacent to Phoenix's western edge. This upped the stakes considerably: fly to Phoenix to eat great pizza and see a good friend? How could I pass this up? The answer was, I couldn't, and I didn't. What follows is my Phoenix experience from the moment I touched down at the airport to receiving not the first, but the second check of the evening at Pizzeria Bianco. The Phoenix Sky Harbor International Airport is an enigma of mind-numbing proportions. It is comprised of four disconnected terminals in the least-intuitive arrangement you can fathom. Unlike most airports, you can exit PHX from two directions, both the north and the south sides. Convenient? In theory, yes, but in actuality, no. Confusing? Absolutely. Read on. Upon stepping off the plane into Terminal 4 at 2:55 in the afternoon, I knew I had several hours to kill before my friend arrived from Los Angeles at 9:00 that evening. Performing some quick calculations in my head, I toyed with the idea of hitting Bianco solo: Let's see here, it's 3 o'clock now...Bianco opens at 5pm...I can do this. 1. Turn left and follow the wall on your right past three or four baggage carousels. 2. About halfway across the room, make a 45-degree turn to your left toward the far corner. 3. Continue in that direction until you reach the elevators in the corner nook. 4. Ride the elevators to Level 2, then step out and make a right turn. 5. Watch the right wall (not the left, that's the north side!) for Door #22, about thirty paces, and go through those doors. 6. Outside, turn right and walk approximately 50 feet past the shuttle bus stop to the city bus stop. There is no reason on God's green earth why catching the bus at an airport should be so convoluted, or why I should ever have to make a 45-degree turn anywhere. In every other airport I've flown into, the buses are waiting just outside the baggage claim area. That's where they always are, because that's where it makes sense for them to be. But I digress. Eventually the bus showed up and I took it to the closest stop to Pizzeria Bianco, about a block away, and stepped out into 104-degrees sunshine so bright my hair immediately went five shades lighter. I kid, but this heat was nigh-unbearable. How could anyone live in these conditions? I wondered. I was out of the cool cradle of the air-conditioned bus for fifteen seconds and already I was starting to perspire from every pore on my body. Lovely. Pressing on, I made the walk down 7th Street to Pizzeria Bianco, which itself is situated in a quaint little plaza called Heritage Square. The time was 3:30pm. There to my surprise I saw a man standing outside Bianco's, a soul who had actually braved the heat to be the first person in line. I took the #2 spot, leaned against one of the shaded wooden tables outside the restaurant, struck up a conversation with the man, and began the one-and-a-half-hour wait. By 4 o'clock the line behind me had grown to thirty strong, and the neighboring Bar Bianco opened. I asked Jim (yes, I was on a first-name basis with the guy at the head of the line by now) to hold my place while I went to buy a cold pint of ale. I went through three pints by the time the restaurant opened, and by then the line was approaching 75 hungry patrons. Fast-forward to the dining room. I'm sitting against one wall with the rest of Jim's family, who had graciously permitted me to join them for dinner. This allowed me the opportunity to try more than one pie on this visit, God bless them. Craning my neck to see over the counter from our table, I was shocked to see that the man himself, Chris Bianco, was not present in the restaurant. 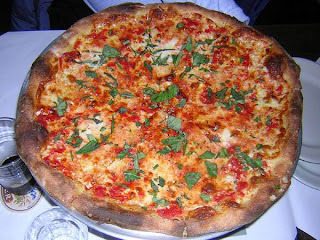 This was quite astonishing to me because, well, much talk has been made of how Bianco makes every single pie himself. I had never heard of him taking a night off, have read no one else's report that he had not been present at their meal. I immediately got a bad feeling, but once the food arrived, all fears that his absence would aversely affect our dinner were thoroughly smashed. We started with the house Anitpasto Plate ($12), a delicious platter piled with vegetables roasted in Bianco's wood-fired oven, soppressata, some cheese, and a few slices of Bianco's excellent homemade bread with olive oil. Everything on the plate was fantastic, particularly the sampling of eggplant parmesan. It was a good sign for what was to come, as we had also ordered four pizzas. Let's begin with the Margherita ($11). It was, hands-down, the very best Margherita I have ever tasted. There are four reasons for this, but no more are needed: incredible crust, fantastic tomato sauce, creamy mozzarella, and flavorful basil. It's really that simple. Chris Bianco makes his own mozzarella, and it is superior to any I have yet had on a pizza. His red sauce is simple, bright, and salted just right, with just a hint of oregano. It is also superior to any sauce I have yet tasted. But I want to make special mention of the crust. It is clearly not an authentic Naples-style crust, but that's not what he's shooting for. It's light, airy, pliant, alternately puffy and flat, with charred (not burnt) air bubbles dotting the rim. It was very flavorful, just as the bread in the antipasto plate was, and slightly soft, a far cry from the more solid NY-style crust. All pizzaiolo should strive for crusts as perfect as Bianco's. If any fault whatsoever could be found on this Margherita, it's that Bianco's second-in-command (or whoever it was making the pies tonight) did not put enough basil on the pie after it was pulled from the oven. The way it was cut, one slice did not even have any basil on it, but I'm sure it was because Bianco himself wasn't at the helm. Our second pizza was the Sonny Boy ($13), which includes the aforementioned tomato sauce and fresh mozzarella, Gaeta olives, and large slices of salami. If the Margherita hadn't been so spot-on, this would have been my favorite pie of the night. It's quite salty, with a strong olive taste, so those with delicate palates may be turned off by it, but I found the flavors intense and pleasurable. The crust isn't quite strong enough to hold up to the mass of toppings on this pizza, so be prepared for folding. The Biancoverde ($14) was the first of our two "white" pies. The Biancoverde eschews the red sauce for fresh mozzarella, Parmigiano Reggiano, ricotta, and arugula. Typically I do not find white pies as interesting as red sauce pies (as the ricotta usually overpowers everything else), but the Biancoverde manages to avoid this criticism by turning the conventions on their side. The peppery arugula leaves are considerably smaller than the ones offered in just about every other pizzeria, and while they bring immense flavor to this pizza, they don't overwhelm it. The mozz, Parmigiano-Reggiano, and ricotta work in perfect harmony with each other, with no one cheese overshadowing the other two. This is a great white pie, and not one I was expecting to like so much. Finally, we have the Wiseguy ($14). This pie also lacks red sauce, opting instead to top the same great crust with mozzarella smoked in Bianco's wood-burning oven, wood-roasted onion, and fennel sausage. The smoked mozzarella is dynamite, bringing a new dimension to the already-magnificent cheese. Cut into long strips rather than crumbled, the fennel sausage was thick and had a great snap to it when bitten into. The onion was good, slightly sweet, but didn't have that same punch of flavor the rest of the ingredients on this pie had. All in all, this was probably my least favorite pie of the night, though "least favorite pie" may be misleading: it's still better than 99% of the pizzas available in the rest of the country. My companions and I all agreed it would benefit greatly from the addition of the red sauce. Pizzeria Bianco offers no desserts, so once we were done with the pizza, we paid the bill and vacated our table for the next eager group, who by then had been waiting in line nearly two hours. I thanked Jim and his family for letting me dine with them, then caught the next bus back to the airport. Once my friend Mark arrived and we had secured a rental car, he mentioned that he had not eaten anything for several hours and was famished. Pizzeria Bianco came up. It was fifteen minutes to ten o'clock. Could we make it in time? Mark was willing to find out. Slamming the accelerator to the floor, Mark cruised down the freeway to the 7th Street exit, navigated around a series of Road Closure signs, and pulled up outside Bianco's with minutes to spare. While he drove off to find a parking space, I got out and secured our names on the waiting list. The hostess (who vaguely recognized me from that afternoon, but assumed I had eaten there previously on a different day) informed me the wait would be an hour-and-a-half to two hours; I was just grateful (and amazed) Pizzeria Bianco still took names right up until closing time. The wait ended up being only about an hour, during which time Mark and I sat on a bench outside in the relatively cooler 90-degrees air, sipping on pints of cream ale. When we finally got into the restaurant, the last group served that night, Mark knew just what he wanted: a Margherita, a Sonny Boy, and a Wiseguy. I still wanted to try Bianco's Marinara and Rosa pies, but I was in no position to argue, having already eaten there once that same day. Mark loved the pizzas, particularly the Margherita, and informed me he could devour three of them by himself. Our waiter, overhearing him, gestured to a young man sitting at the bar, clearly a regular. "That kid's the record holder," he told us. "He's eaten five of them." On our way out, Mark stopped by the bar to challenge the lad to an eat-off the next time he was in town, and the kid gladly accepted, much to the amusement of our chuckling waiter. So there you have it, my dual experience with Pizzeria Bianco. I am not a huge fan of the city of Phoenix, but I can say this: I will return to Pizzeria Bianco in the future, as many times as possible. My favorite single pizza may still the Hot Soppressata and Basil pie at Ken's, but overall, Chris Bianco is serving the very best pizza I have ever eaten. I cannot envision better pizza being made anywhere, but my quest shall continue regardless. 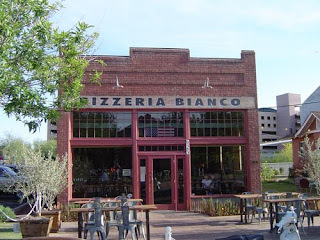 If you call yourself a lover of pizza and have not sampled Chris Bianco's pies yet, they are absolutely worth a foodie trip to Phoenix, even if you have no other reason for being there. They're that good. No. They're that great. Next time, though, I'll skip the volleyball. In Portland, Oregon, a veritable melting pot of tree-hugging hippies, tech-savvy yuppies, organic food junkies and white trash, a pizza revolution is beginning to take form, and the most popular iteration of this burgeoning pizza haven must certainly be Apizza Scholls. Nestled between a chocolate shop and the Bar of the Gods on hip Hawthorne Boulevard, Apizza Scholls dishes out whole pies to legions of local fans seven days a week (5pm - 9:30pm Monday thru Saturday, 4pm - 8pm Sunday). Such is the enthusiastic fervor surrounding the pizzeria that lines can form thirty-strong or more an hour prior to opening on Fridays and Saturdays, making a simple walk-in-sit-down-and-order an impossible affair on busy weekends. To-go orders are available only Monday through Wednesday, but after that, expect a long wait if you're not there when the doors open. After the moment of heart-stopping elation that comes when the hostess calls your name, you're ushered to one of the ten or so tables in either of the dual dining rooms. Décor is sparse, with simply painted walls adorned with the occasionally piece of framed artwork. It's really nothing special. But you're not here for the atmosphere, you're here for the eats! Thankfully, Scholls has several beers on tap to get you nice and buzzed, all at $4.50 a pint (except for the Schneider Hopfen-Weisse at $6), as well as nearly 30 more bottled. Several red and white wines are also readily available, along with an impressive array of Boylan's soft drinks. The menu is as expansive as the drink list. Beyond the usual house and Caesar salads ($7 and $8, respectively) you'll find some delicious antipasti options, such as an assortment of delicious cured olives ($5), a veggie plate with roasted red peppers, olives, sun-dried tomatoes, cherry peppers, Fior di Latte, and grilled artichoke hearts ($10) and a meat plate with proscuitto rosa, salame Gentile, soppressata, salame Siciliana, and mortadella ($10). Your best bet is the House Antipasti Plate, which offers a hearty mix of both the meat and veggie plates. All of it is cured to perfection and a steal at $12. And that brings us to the pies, and what pies they are. An unabashed mash-up of New York and New Haven styles, pizzas at Scholls are large 18-to-20-inch discs with a well-charred, crisp crust that holds up well to the toppings, whatever they may be. The air pocket-filled outer crust is bubbly and perfect, with a nice crisp crunch giving way to a light, chewy center. Owner and head pizzaolo Brian Spangler closely monitors every pie in his electric oven with an infrared thermometer gun, watching them char under controlled 700°F+ heat and making sure each one comes out perfect. As far as I can tell, he has succeeded every time. Scholls neophytes should begin with their version of the margherita, known here as the 'Margo'rita ($20). Atop the impeccable crust you'll find a vibrant tomato sauce, a mix of both fresh and aged mozzarella, pecorino romano, plenty of fresh garlic, olive oil, and basil. The garlic and aged mozzarella meld in the oven and give every bite of this pie a solid punch of salty, garlicky goodness. Even better is Apizza Scholls's incredible Sausage Pie ($20). Hefty chunks of sweet fennel sausage (made in-house!) are scattered in perfect balance over the plain pie, and after repeated trips I can safely say I have never had a better version of it. If and when you come to Scholls, do not pass this one up. It is absolutely delicious. Though I am not the biggest fan of white pies, Apizza Scholls's New York White Pie ($22) is one of the best I can recall having. Here the red sauce is forgone for layers of mozzarella (both fresh and aged), pecorino romano, fresh garlic, herbs, black pepper, sea salt, and olive oil. Bring an additional element to the white pie with the Bacon Bianca ($22), which adds the house-smoked bacon to the party. The luscious pork belly brings out the flavors in the cheese, herbs, and garlic, and is a revelation. Scholls offers a single item on their dessert menu: It's-It Ice Cream Sandwiches from San Francisco ($2). These tasty little sugar bombs are composed of a scoop of vanilla ice cream sandwiched between two oatmeal cookies and dipped in dark chocolate. They're good, but after stuffing your face with three or four large slices, chances are you won't have room for them. 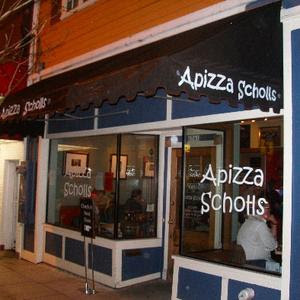 If you're in Portland for any reason and consider yourself a fan of pizza, skipping Apizza Scholls is the most cardinal of cardinal sins. A Slice of Heaven author and Serious Eats founder Ed Levine named it one of the "Top Five Pizzerias in America," and after just one of Spangler's masterpieces, you'll understand why.